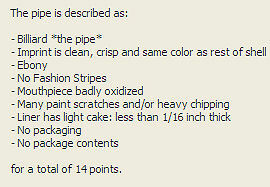 The value of pipe #381 is 14 points. Sue Cook offered this pretty beat up specimen on eBay and, although there was stiff competition, I won the bidding. It neatly fills a cell on the Table of Colors and Shapes of the pipe - MADE IN ENGLAND and I have no regrets. A slightly better example has come my way, so this one is now a Pipe for Sale. Melvin Longcor bought it.